Program Description: Florham Park does not provide garbage pickup. It is up to each resident to contract with a private hauler that will collect and dispose their waste. The municipality does not pay for the tipping fees. 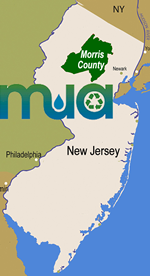 Program Description: Florham Park contracts for single-stream, all-in-one residential curbside recycling. Maximum weight of curbside recycling container is 50 pounds; use multiple containers if needed. Schedule: As of January 3, 2019, Florham Park has curbside recycling collection every other Thursday. Plastic #1 (PETE) Bottles	(Recycling - Single-Stream - All-In-One) Commingled with container mix. Only bottles with a neck smaller than the base are acceptable. Program Description: Curbside collection. Contact Florham Park for schedule. Schedule: Leaves and brush are picked up curbside. Contact the town for schedule and instructions. Christmas Trees	(Recycling) Accepted curbside for chipping beginning 1/9/2012. Remove all decorations and no tree bags or stands. Grass Clippings	(Recycling) Residents are encouraged to "cut it and leave it." Schedule: Check with the town for more information. Tires	(Recycling) These are accepted only periodically so contact Florham Park to see when tires will be accepted. Click below to view original documents regarding Florham Park Borough. If inconsistencies are discovered between these documents and the information provided below, one should initially assume Florham Park Borough document is correct as it was produced directly by the town. Please contact Florham Park Borough to verify any issues you are uncertain about and please forward any corrections to the MCMUA at info@mcmua.com.